I have spent many sleepless nights crying due to severe ear pain quite a few times in my childhood. And till today, I literally get scared the moment I think of the earaches. I have been a victim to extreme ear pain many times in the past and I know how terrifying it could get. I can very well relate to those of you who find earaches unbearable. Ear aches, even if happens mildly can really be very frustrating. And the worst part is not only you have to bear the constant nagging pain in your ear but also you face a lot of difficulties in swallowing, breathing, chewing, talking, coughing, sneezing etc. But thankfully, I came to know about some natural earaches home remedies that helped me get rid of it. 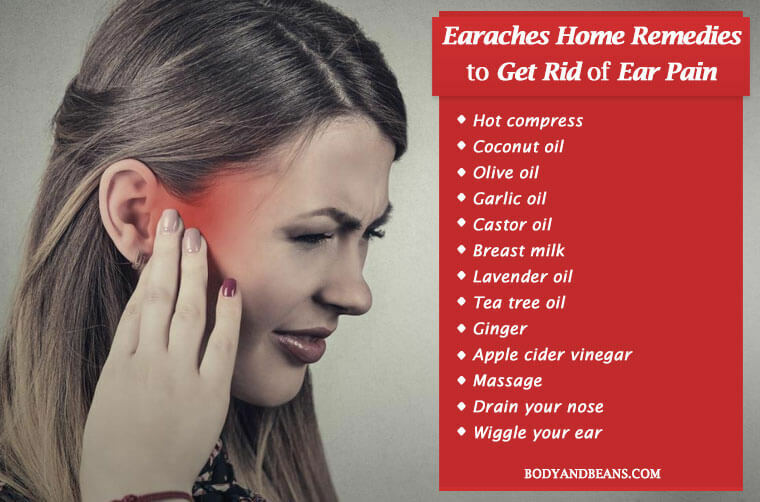 If you are tired of earaches and wondering about how to get rid of it fast and naturally, then you may like to check some of these earaches home remedies, that I am discussing right here in this post. Earaches can be unbearable and if the earache is not cured quickly, the pain actually spreads to all of the surrounding portions, and within a few hours, you can even notice the inflammation. There are medicines for everything and that is not an exception for earaches as well. But at times, emergencies occur and you may not be in a position to get hold of medicines or ear drops. That is why you must always be aware of natural first-aids for earaches which are nothing but usage of some therapeutic natural ingredients in the right way. These remedies can also be very effective in a situation when you don’t have access to the medicines and your ear pain needs immediate attention. Many a times, the pain in the ear starts very mildly which you often ignore assuming that it will get to normal on its own. Well, in many cases it does but if the nagging pain continues, you should not make further delay and start the treatment. The reason I mentioned this is because earache is an internal pain and you cannot see what’s happening from outside so easily. So you never know what shape it can take if you delay the treatment. It can become an infection as well causing more trouble to you. 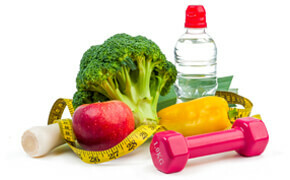 In most cases, we rush to the doctors for expert help and that is OK. But what are you going to do when you are in a situation where the pain becomes so much that you find it difficult to get up and visit a doctor’s clinic. Moreover, if you develop the pain during nighttime, contacting a doctor and getting medicines immediately may become difficult. These earaches home remedies can come handy in such situations because most of the ingredients that are used here are readily available at your home, almost all the time. And so you can start with your cure instantly and not allow the pain to get severe. However, before we start our discussion on earaches home remedies let us learn about the causes that may trigger an earache. This is because you will be able to solve the problem from the roots only when you know the cause behind its occurrence. Now, that you have a fair idea of what could have possibly led to your earache, it is time to check some of the best earaches home remedies that can be very effective in curing the ear pain. Nature has gifted us with many natural ingredients having magical healing powers. You just have to know about these ingredients and learn to apply these ingredients correctly to get the maximum benefits in healing the common health disorders including earaches. In case of earaches as well, there are natural remedies to get rid of it. So if you are OK going the natural way instead of simply depending on the prescribed drugs, then try some of these earaches home remedies as discussed below, to get rid of the ear pain fast and naturally. In order to reduce the ear pain and the inflammation, you may apply hot compress, which is considered to be very effective in killing ear pain. You can simply use a hot pack or electric heating pack to get rid of the pain. This is because the heat helps to soothe the pain and give you the much-needed relief. This is one of the most ancient and popular home remedies for earaches. You can give it a try and see how it works for you. The method of using hot compress to kill ear pain is very easy. You just have to apply the hot pad to your affected year for about 20 minutes. Ask someone to touch the throat and the neck with the heating pad for maximum results. However, make sure that the pad is not unbearably hot. Also, do not fall asleep with the heating pad. In case of children, make sure you supervise and even consult a professional doctor. You may also like to try alternate hot and cold compress because for some, it gives better results in killing earaches. In this case after you have applied the hot compress for 20 minutes, you just need to apply the cold pack for 20 minutes. For the cold pack, you may wrap ice cubes in a paper towel, cover it with a light cloth and then hold it to the affected ear. It should not be very cold and you must avoid directly putting ice cubes on the skin. Earaches are often caused by microbes and if that’s your case, then coconut oil remedy can be great for you in killing ear pain. The primary reason is the presence of lauric acid in it, that impart antimicrobial properties to the oil. So, when you put the coconut oil in your ear, it fights the microbes and reduces the pain. Coconut oil is also anti-inflammatory in nature, so within some time the swelling also reduces. Take some virgin coconut oil and with a dropper, pour a few drops of it inside your affected ear, and then cover it with a cotton ball. After that, open and close your jaws repeatedly for a while in order to allow the oil to reach all corners of your ear. After 15 minutes, remove the cotton ball and excess oil. If you repeat the remedy two times in a day, you will certainly get fast relief. One of the widely used home remedies for earaches is olive oil. Olive oil with its herbal additives can easily lubricate your ears and prevent the occurrence of ear infections. It is also capable of reducing the swelling quite fast. Take some virgin olive oil and heat it. Now, tilt your head and pour 2-3 drops of warm oil inside the affected ear. Try to stay in that position for about 5 minutes. After that, using a cotton swab, try to clear the excess oil and any other debris that comes out of your affected ear. Apply this two times a day until you get complete relief from the pain. However, just be sure that the olive oil is not too hot because that can burn your ears. You may be freaking out after imagining garlic inside your ears but if you can actually apply this remedy properly, you are going to be greatly benefitted. The reason behind the recommendation of garlic is due to its anti-microbial properties, which is very important to give you relief from an earache caused because of an ear infection. You can also use garlic along with olive oil and eucalyptus oil to derive the benefits of the other two oils as well which in turn will lead to faster results. Take around 5 garlic cloves, crush them and then heat them along with ½ cup of olive oil and around 20 drops of eucalyptus oil. Now, put a few drops of this solution into the affected ear and get the relief from the pain within a while. There is however, another method of using garlic for earache as well. This time you can use some sesame oil along with minced garlic. For best result, use any one of the two methods two times a day to get fast results in killing earaches. In case you thought castor oil is just meant for hair, let me just tell you that it has got other benefits as well, one of which is reducing earaches. It contains antioxidants as well as it has got anti-fungal properties that help reduce the infection and relieve you off the pain. Take some castor oil and lightly warm it. Then put few drops of the oil into the affected ear. After that, close your ear using a cotton ball in order to let the oil stay inside your ear for few minutes. Then you will have to remove the cotton ball, and clear the excess oil and debris that comes out. You may feel it to be weird but yes, breast milk is good in relieving earaches. This is because it is filled with antioxidants that help in reducing the infection. It also reduces the inflammation that accompanies the pain. This remedy can be very handy for the new mothers in case their child is suffering from earache. You just need to carefully drip few drops of fresh breast milk inside the affected ear. For about 5-7 minutes, allow it to sit and drain out the excess after that. Repeat the remedy 2-3 times a day for maximum benefits. The next remedy that I am going to talk about is the lavender oil remedy because this oil is extremely soothing to your nerves and will help you get rid of the pain that has been so long making your life hell. Lavender oil is antibacterial and anti-fungal in nature that helps fight the microbes and reduce the infection that has led to the ear pain. Take a cotton ball and pour 2-3 drops of lavender oil on it. Now, place the ball at the opening of the affected ear. At the same time, put a drop of the essential oil in your other ear and massage it for a while like around 1 minute. Repeat the remedy 2 times in a day for maximum benefits. If you have got some tea tree oil in your home, then you can definitely use it as a first-aid to treat your earache. The primary reason is because it is a great antiseptic agent. However, using it in its diluted form may cause irritation in your skin, so it’s better to use it along with olive oil as then the combination will just be perfect to kill the infection causing germs which eventually will reduce your earaches. Take a few drops of olive oil and dilute it by mixing with around ¼ cup of olive oil. After that, pour 2 drops of the solution inside the affected ear. Keep your head tiled for about a minute with the affected ear facing the ceiling. This is important for the oil to work its wonders. After that, go back to upright position and clean the excess oil and the debris coming out of the ear using a cotton swab. Doing it 1-2 times a day will give you fast relief from the pain. One of the great home remedies for earaches is the ginger remedy. This is because of the presence of the gingerols in it that are anti-inflammatory and anti-bacterial in nature which helps in reducing the pain and the inflammation caused due to the pain. Take a ginger root and after grating it, mix 1 teaspoon of it with 2 tablespoons of olive oil. Allow the ginger to sit in the oil for about 10 minutes and then add 2 drops of it into your ear canal using a dropper. The remedy is quite effective and applying it twice a day, will help you reduce the ear infection and the accompanying earache fast and naturally. I know that many of you may not be comfortable or quite sure of using apple cider vinegar to kill earaches. But if you are courageous enough, you can definitely give apple cider vinegar a scope to prove its worth as far as relieving you of the earache is concerned. The main reason behind its recommendation is the anti-inflammatory properties that help in reducing the pain as well as in reducing the inflammation. Take some apple cider vinegar and put 2-3 drops of it in the affected ear. After that, you have to let it stay to get air-dried. This remedy can be repeated every 12 hours until you fully recover from your earaches. If your ear pain has radiated from the jaw or the teeth, then you can try out massage in order to get relief from the ear pain. You can massage on the tender portion or its surrounding areas. Like for example, if the portion behind the affected ear is hurting, you can do some massaging of your jaw and neck. Proper massage may even come to your help when you are getting the pain because of an ear infection. In a downward motion, you can apply pressure starting from behind your ears and go down to the neck. Then while continuing to apply downward pressure, try to work forward that is to the front of your ears. Such massages actually help in proper draining of the excess fluids out of your ears that prevents your earache from worsening. What else you can do to get rid of earaches? Besides the above-mentioned earaches home remedies to kill ear pain fast and naturally, there are a few other tips and tricks as well that’ll help you to get rid of ear pain. At times, you get pain in your ears when you have a blocked nose as that prevents the fluids from draining out from the ears. So, you may clear your nose with a saline spray or gentle suction to allow the ears to get naturally drained. You can give it a try and see how it works for. Most of the time you get the ear aches due to the inflammation and the accumulation of fluids inside your ears. So, when you sleep with your sore ear facing the sky, it allows the gravity to give you some relief from the pain by draining away the fluids inside your painful ear. Earaches often stems from eustachian tube that connects your inner ear to your throat and balances the pressure of air around your ear drum. When it gets blocked with the fluids, it often leads to the pain similar to the one we experience while changing altitudes. In such a situation pulling the ear lobe up and down in a gentle manner can actually cause the tube to pop giving you some relief from the pain. Now, if you are getting the ear pain due to the pressure fluctuations on a plane, then chewing gum can be a practical solution for you. Over to you: which earaches home remedies have worked for you? Earaches are not at all pleasant so the sooner you can get rid of it, the better for you. Painkillers and ear drops are always there to treat the ear pain. But if it is an emergency and you are not having the medicines in your home, then what are you going to? It is important that you are aware of some natural first aids that can give you relief from the ear pain within a short while. And, these first aids are nothing but the usage of some of the common natural ingredients, most of which are available in your home all the time. I have already shared a few of the best earaches home remedies that can help you to kill ear pain fast and naturally. I have myself tried many of these natural earaches home remedies and I can confirm that it has helped me kill the pain. I have been hugely benefitted in getting rid of terrifying earaches using these remedies. And if you are suffering from sudden earaches, you may like to try some of these remedies to get rid of earaches naturally. However, if you find that the earache is not getting any better even after using these remedies, then it is best to visit a professional doctor. And, if you are aware of any other natural home remedy for earaches and have been personally benefitted from it, then please feel free to share that with us. I will be happy to add that in this list. Until then, stay healthy and do not let an ugly earache ruin your day.